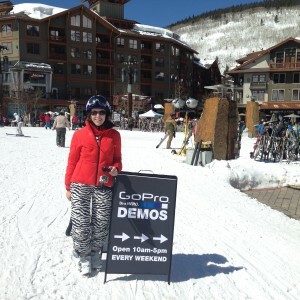 I rented a Go Pro Hero 3+ Silver edition video camera this past weekend during a ski trip. It’s something I’ve considered buying for “adventure” filming, but I didn’t want to spend the $200-plus dollars to find out if it’s really something I need for my camera collection. 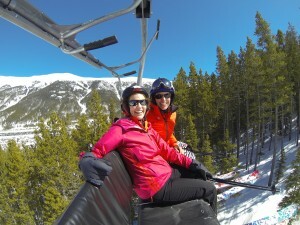 Luckily, while in Copper Mountain, Colorado, I had the opportunity to rent one without having to invest. It was well worth the $50 I paid Woodward at Copper (a local adventure store) for the one-day rental. Here I’ll share what I learned so maybe you won’t feel the need to try before you buy. 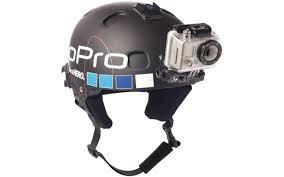 First, I’d seen many Go Pro users with cameras mounted on their ski helmets. In our case, Greg Bejian recommended we try the “pole mount” which I at first thought meant the camera would be attached to my ski pole, but that wasn’t quite the case. The pole mount was actually a horseshoe-shaped hand-held apparatus which was easy to use and gave us many more options than the head or chest-mount setup. 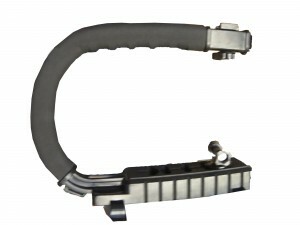 At this time, I haven’t found a link to purchase this exact mounting yet, but as soon as I do, I’ll add it to this blog. You can purchase the camera (or several other versions (Black and White instead of Silver) through Amazon at http:.//amazon.http://www.amazon.com/s/ref=nb_sb_noss?url=search-alias%3Daps&field-keywords=go%20pro, local camera stores, or through Best Buy (http://bestbuy.com) as well through the GoPro website. http://gopro.com/camera-mounts. Keep in mind the pricing is like Apple. No matter where you purchase the products, they are always the same price. So, purchase from a vendor where you feel comfortable and get the kind of service you like. In the case of snow skiing, using the pole mount means you need to be a pretty experienced skier (probably more experienced than if you were wearing the head or chest-mounted camera) so that you can leave a pole behind and you can concentrate on aiming the camera wherever you intend. I say experienced, too, because even if you ski without one of your poles, if you’re concentrating on aiming a hand-held camera while skiing, you still have to focus on who is ahead of you, what bumps are in your path, and if you’re following another skier to catch them skiing, you really have to be careful to watch their path, stopping and starting as well. It was challenging but SUPER FUN. -It was a blast being a ‘flimmaker’ for a day – experimenting with ideas for shot angles and planning the sequence of actions I wanted to capture for my edited “movie” after I ended my day. – The color on the video was vivid and accurate to what we’d experienced in person. 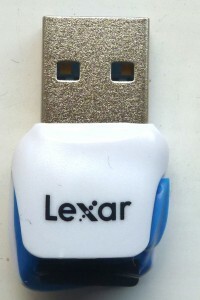 -The pole mount was simple, lightweight and easy to share. 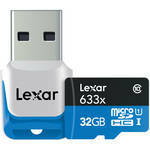 -The 32gb mini SD camera card held more than an hour of video and the battery lasted us for the duration of our shooting. (I’m told it would last several hours even in the cold and we had an extra just in case, but didn’t need it.) And in skiing three hours, we only shot 30 min of video because of stopping and starting, so a 32gb card should last an entire day. -Audio was decent on the Go Pro even though I didn’t see a microphone. -It was easy to angle the camera left, right, up or down with a simple push – and it stayed put till I moved it manually to a different position. -The camera is a fish-eye (meaning super wide angle) so trying to shoot close-ups resulted in distortion (typical of a fish-eye lens). -Editing takes time. (Just like all other video products.) And being a new user to the software, it’s not terribly intimidating, but not totally simple either. I’m trying to add in still photos and text over some of the video and a few “bells and whistles” – and that’s taking some time to figure out. 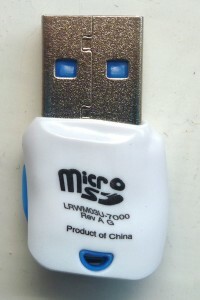 -Mini SD camera card reader I purchased for the experiment melted in the USB port of my computer. If I hadn’t first copied all the files to my hard drive, I would have lost all of our footage. (Left image shows the original card and USB reader, and the other two images show what it looked like after overheating in my USB connection.) Luckily it didn’t damage my computer. But word to the wise, remove photos ASAP from mini drives like this just to be safe. 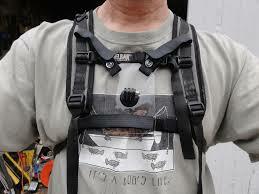 Bottom line is I’d recommend the video camera for the adventure of skiing, sailing, para-sailing, even cycling. But just know what you’re going to need to invest quite a bit of time in learning the software (even though it’s easy) and you’ll have to do some zooming during editing so that objects are closer than they were originally seen in the footage.